Graduate Credit at AppsEvents Summits, Certification Bootcamps & More! Available via AppsEvents worldwide beginning Fall 2016 ~ graduate credit through the College of Saint Joseph! Join us in Hong Kong, Seattle, Zurich, Barcelona, Finland, Arkansas, Italy... visit appsevents.com for a complete list scheduled public events. 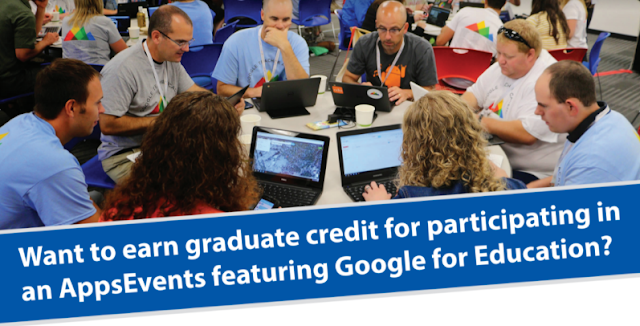 College of St. Joseph is partnering with AppsEvents so participants can earn up to three graduate credits for participating in either a Google For Education Summit Academy or Bootcamp. Once the student completes the Google for Education Bootcamp or Summit Academy, the rest of the course will be completed 100 percent online. The student will have two weeks (14 days) from the last day of theGoogle for Education Bootcamp or Summit Academy to develop the required documentation. The documents must be uploaded to the designated Google Drive folder, before the due date, to earn full credit. Successfully complete either Google For Education Bootcamp, Summit Academy, or both. Develop a learning activities (or activities) that will integrate computer technology into a lesson(s) at the adaptation level of the CSJ Technology Integration Rubric. If you do not see an event in your area, please contact us about hosting a Summit Academy, Google Educator Certification Bootcamp and/or Summit. Email veronika@appsevents.com directly for more information or submit your request here..